In the end, I missed doing a Miscellany post last week, so I’ve rolled a few of the photos into this week’s post. The week has been very busy, between our first MAPS visits to all three sites, and some inconveniences related to the sale of our house. The landlord has received an offer, so barring any serious problems with the home inspection later this week, the house is now sold. That means we have until the end of the month to move out (as per a termination of tenancy agreement reached some time earlier). We’re still finalizing the details about where we’ll be in three weeks – more on that once we know more ourselves. This photo is from a walk with Raven last week. 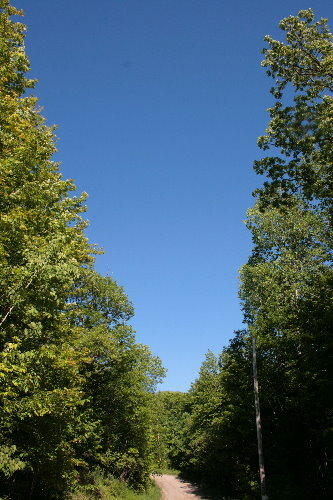 The sky was just so incredibly blue, the most amazing shade of indigo, almost the perfect shade of an Indigo Bunting. On the same walk, I took her to the water’s edge of the lake that the road butts up against, with the intention of throwing the stick out for her. When I peered in, however, the water was full of minnows. And I mean absolutely chock full. 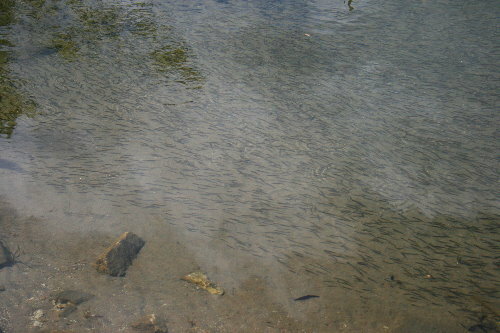 I don’t know how to tell all the little fishies apart – minnows, dace, shiners, etc. They all just look like small, thin fish. Possibly if I was able to catch one (not likely, they move so fast!) it would be easier to pick out identifying features. There had to be some thousand or more of them there in the shallows. After observing them for a bit, I decided to take Raven up the road a bit to a different spot to swim. 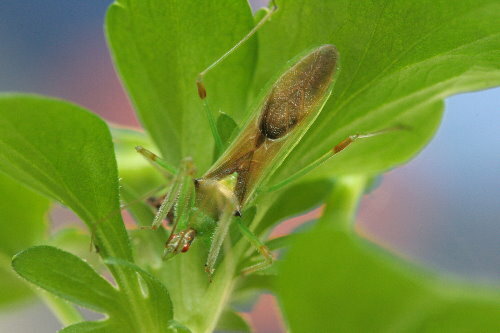 I’ve found a lot of six-legged critters this past week, so this post will be a little insect-centric. This first one is, I think, a member of the genus Odonteus, or at least that’s my best guess based on the images in my trusty Kaufman guide to insects. The beetle was found in the upstairs studio by our friends and guests who we had up to visit a couple of weekends ago, as they were preparing to go to bed in same room. I was intrigued, and tucked it away in the fridge for a later photo. The long, thin horn seems to be fairly distinctive, although it’s a feature that only some members of the genus have. Presumably these are used for “fighting” between males, as only the males sport them. 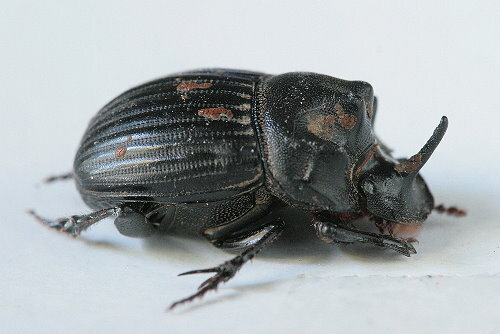 They’re part of the taxonomic family Geotrupidae, the Earth-Boring Dung Beetles. As the name implies, the adults build burrows where they lay their eggs and provision them with food (eg. dung). This jumping spider turned up on Dan’s bag at the end of the morning during one of our MAPS visits. I may not have noticed it at all, it it wasn’t for it vibrant colouring. I believe it’s Phidippus whitmani, but there are so many species of jumping spider I don’t like to label things unless I’m certain. From what I can tell, at least through BugGuide.net records, it seems to be a fairly common species of the eastern continent. Its coloration apparently mimics mutillid wasps, also known as velvet ants, which can give a very painful sting. The “garden” continues to turn up interesting critters among the foliage. This amazing beetle was found clinging to the underside of one of the leaves of my morning glory. It’s a Goldon Tortoise Beetle, Charidotella sexpunctata, is found through most of the eastern continent and feeds, unsurprisingly, on morning glories. Their striking metallic colours are created through structures in the outer shell. They have the ability to change their colour at will just by pumping in or removing a fluid to microscopic cavities in the shell. When the golden reflective is absent, they are a dull red – you can see that base colour shining through here. This one was in the leaves of my johnny jump-ups. I believe it’s an assassin beetle of the genus Zelus, possibly Z. luridus. This species is found through eastern North America, feeding on other small insects that happen to cross his path. 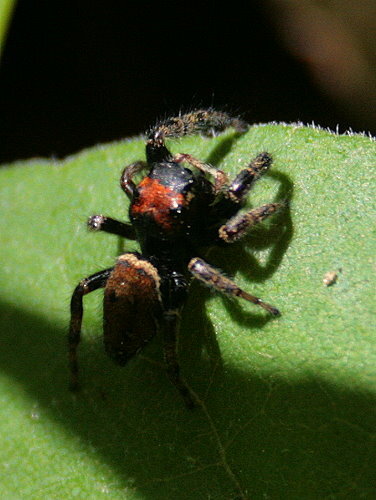 It has sticky hairs on its forelegs that it uses to keep hold of its prey with. This final insect turned up in my moth trap one morning. 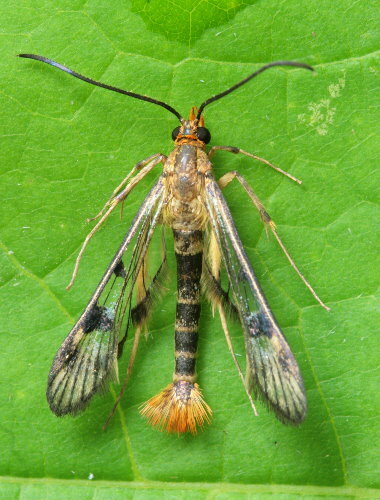 It’s a Maple Callus Borer Moth – yes, a moth! – which is part of a group of moths known as the clearwings. Most, except for this species, don’t come to light. However, for those so inclined, they can be drawn in using pheromones. Like its name says, this one is a pest of maples. Merlin showing Raven how much he loves her. 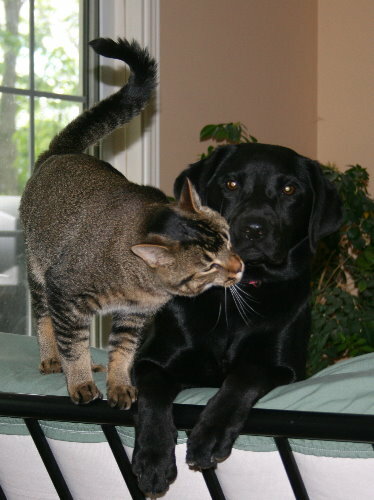 Raven seems less enthusiastic about the affection. That swarm of tiny fish is impressive! And ‘Wow!’ for the metallic beetle. Although all the little critters are impressive (I’m a nut for insects and arachnids and the like), I’m thoroughly impressed with that chrome dome. Very cool. Merlin and Raven look so cute together. I had to laugh at the look on Raven’s face. Merlin looks so happy and friendly, but poor Raven looks like she’d rather be at the vet. Great moment. Usually I would expect the cat to be the less interested party. 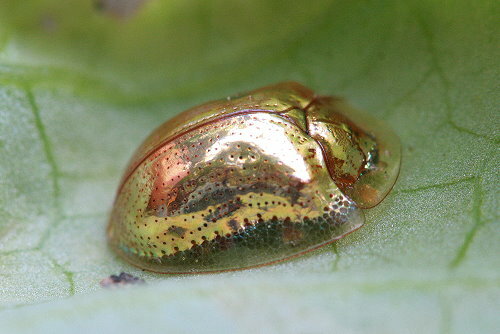 That Golden Tortoise Beetle is awesome!